Gov. 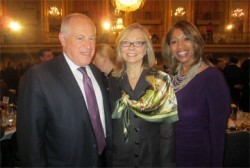 Pat Quinn, Susan Whiting, vice chair and chief diversity officer, Nielsen; Cheryl Pearson-McNeil, senior vice president, public affairs and government relations, Nielsen join hundreds of supporters during the 26th Annual Interfaith Breakfast, hosted by Mayor Rahm Emanuel. Nielsen sponsored the event.